Last Fall with permission from Lakewood Mayor Michael Summers and help from Lakewood Park staff, project leader, long time Lakewood resident, L.H.S Graduate, and Lakewood Urban Bird Society founder, Jim O'Reilly PhD. removed the large Purple Martin House that has been at the park since February of 1989. Jim put together a small group of volunteers to assess the condition of the Purple Martin House and put together a plan to make repairs and get the house back up in early Spring when Purple Martin return from Brazil looking for nesting sites. After the Purple Martin House was brought down from the pole (park employees used a crane – the winch for lowering and raising the house appears to have been broken for many years and needs to be replaced or repaired) it became clear a lot of repairs were needed to the structure after nearly 30 years of not being maintained. The 54 room Purple Martin House, which is much bigger than it appears high up on the pole, is made of aluminum and was built by Stephen Dubiel beginning in the late 1960's and took approximately three years to complete. Mr. and Mrs. Dubiel donated the Purple Martin House to the city in February of 1989 in memory of former Mayor Frank Celeste. Order Spring Flowers Now, Support PTA! Do you like begonias? Are you an impatiens person? Or, are you partial to peppers and parsley? Lakewood Council of PTAs has them and more for sale as part of its 2018 Dean’s Greenhouse Spring Flower and Plant Sale! Dozens of varieties of quality flats, 4.5” pots, hanging baskets of flowers, herbs and vegetables are available for order just in time for Mother’s Day, or to fill in your own flower beds or vegetable garden. A portion of sales supports Lakewood Council of PTAs. 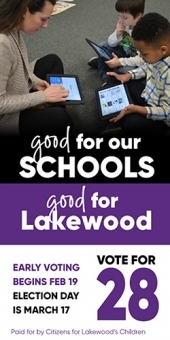 Lakewood Council of PTAs provides collaboration, leadership training and coordination of the efforts of its member PTAs and PTSAs within the Lakewood City School District. It is a key communication link between these local school groups and the district, state and National PTA as well as Lakewood City School District’s Board of Education and Administration. What goes around, comes around. Back in the seventies, tropical plants were all the rage. Wandering Jews, Corn plants, and Swedish ivy were household names and everyone knew how to macrame to hang their favorites. LAKEWOOD PLANT COMPANY has revived that tradition and is enhancing it with 10 foot Birds of Paradise, 3 foot wide Monstera plants and a large succulent and cactus selection. As the owner of Lakewood's only local pest control company, we have a slight insight into the state of local pest infestations. Although not every resident calls us for their pest problems, we do hear from multiple residents per week. We get a lot of carpenter ant calls, along with yellowjackets, mice, cockroaches, and spider calls. It depends on the time of year. AHHH!! What's Happening To Our Big Trees?!?! I’m sure that’s been a major topic of conversation the past few weeks. As an arborist who loves big trees, I understand the sentiment. In hopes of dispelling rumors, let me get some answers straight from the horse’s mouth (my apologies). It's Time To Stop And Smell The Rose Garden! Roses are awesome plants with many rewards for their owners: rose plantings last for many years and are beautiful, fragrant and available in a myriad of colors. With so many varieties, choosing one can be a little thorny! Seven different types of rose bushes are available. Hybrid tea are single stem beauties, like what you would see at a florist. Floribundas are bushy shrubs with flowers on every stem instead of just one. Grandifloras are single stem roses with multiple flowers. Climbers are more aggressive and, with a little help, can be trained over an arbor or on a trellis or fence. Miniatures are hardy little plants that do well in containers or small spaces. Tree roses are typically grafted onto a stem and resemble a lollipop and can be quite stunning. Last, but certainly not least, are the shrub and groundcover roses. These low-maintenance shrubs come in many colors and are blooming machines. Mine actually bloomed through mid-December this past year and were covered with flowers. It’s about 10 a.m. on a crisp April morning. Everyone is focused: heads down, eyes busy surveying the land, visually plotting where the next seedling is destined to grow. Others dig out a new wheelbarrow path, contributing only the steady scrape of their shovels to the aural landscape. Robins dance on the freshly dug beds that stretch across the field, which days before contained rows of hearty kale, collard greens and lettuce. Spring is here, and the workers on Stanard Farm are diligently preparing for the next growing season. But this farm is unlike any other. Located just outside the St. Clair-Superior neighborhood on the Near East Side, Stanard Farm is a green oasis amidst miles of concrete. Just shy of an acre, Stanard Farm produces poundage of fresh produce in the thousands each year. A cutting-edge example of sustainable urban agriculture, the farm also uses season-extension techniques (such as the use of unheated low-tunnels and hoophouses) to allow for harvest beyond the standard Northeast Ohio growing season. Six years ago, my fiancée and my brother talked me into buying a house here in Lakewood. We found a nice house on Coutant and have been busy fixing it up. By nature I am a lazy sort so I thought rather than having grass in my front yard I would plant a garden. What could be easier than pulling a few weeds as opposed to mowing and trimming once or twice a week? Boy, was I wrong! At the end of the first season it was a cinch. The flowers bloomed and there was beauty all around: front yard, back yard, gardens galore. I amazed myself. Since it was the first season there were not many weeds, and it was quite manageable. Cleveland, OH – The National Wildlife Federation has recently awarded 13 adult volunteers the status of Habitat Stewards. These dedicated volunteers have worked through 25 hours of training in the Habitat Stewards program and are ready to serve as mentors in their communities, working to help residents in their communities transform their schools, worksites and backyards into wildlife habitats. Are You and Your Pets Prepared for a Major Disaster? As a nation, as citizens of this planet, we have watched many catastrophes unfold. We were warned of Hurricane Katrina, and as I saw the devastation, my heart ached for those who survived the winds and water, but whose lives were forever changed. I cheered for the heroes, and prayed for their continued strength and mental stability as they mopped up that mess. Due to Lakewood's inclement April weather, the Friends of the Lakewood Dog Park Garage Sale has been rescheduled for April 21. The event will raise funds for maintenance and supplies for the park. In the event of bad weather, the event will be postponed until April 28. As springtime arrives, many people become motivated to get into better shape. Most people do better with an exercise routine if they have a partner to keep them company. However, human partners can be unreliable. They have work schedules, appointments and families to disrupt their routines. Dogs, however, make great exercise partners since they are always ready to go, they never have appointment conflicts and they often nag you to get going. Hi, my name is Sambucco. I am a gorgeous black cat with green eyes. I was rescued by a nice lady when the temperatures were bitterly cold in January. At first I was very frightened and wouldn't let anyone touch me, but the lady was so nice that eventually I warmed up to the idea of being held and pet. You know, I really started to like it! Now I just want to sit with someone and snuggle while they watch TV. I would like to play with that special someone too. The last few days have been hard. With the recent deaths of friends' relatives and witnessing their grief, the heavy snowfalls that created icy roads, skid-outs, accidents, traffic jams, flaring tempers, snow bans, and parking lots filled with snow banks caused by snow plows, and worse of all the need for shoveling my driveway. Then the city snow plows doing their job and blocking off the driveway just shoveled. As we all know, winter in Lakewood has been especially brutal recently.. The cold temperatures are especially tough on homeless animals, including one little dog that was recently saved by Lakewood's Animal Control officers. The brave little dog, known as Punchy, is now in need of a loving home. Thousands of Lakewood residents love their pets. In fact, most consider their pets to be part of the family. They spend lots of time and money making sure that their companion animals are happy and healthy. However, there is one eventuality that many local pet owners fail to consider. What happens to your pet in the event of your death? A recently passed Ohio law is designed to help pet owners plan for their animals’ future. As we all know, Lakewood is a city full of pets, and many residents consider their dog or cat to be part of the family. This is why it can very traumatic for a family when a pet is missing. The ordeal can place tremendous strain not only on the lost animal, but also on the family that is looking for it. Summertime is an especially risky time for pets, since so much outdoor activity stirs their curiosity. 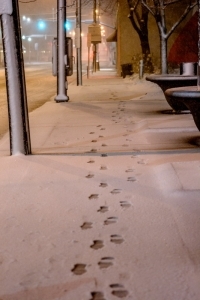 By following a few simple bits of advice, you can reduce the chances that you will ever face the ordeal of a lost pet. One stroll through Lakewood is enough to confirm that this city's residents love their pets. From one end of the city to the next, one can see owners out walking their dogs while cats scurry across yards or watch over the street's activities from a window sill. Our love of four-legged creatures and the desire to help those that are homeless or abandoned prompted the Citizens Committee for a Lakewood Animal Shelter (CCLAS) to work with the city to open up the Lakewood Animal Shelter back in 1985. Volume 2, Issue 5, Posted 10.46 AM / 08th March 2006. As we all know, wintertime in Lakewood can get rough. The holidays are over - the presents have been returned, the decorations taken down, and now all we have is three more months of snow and ice. People spend a lot more time indoors, and many come down with the proverbial "cabin fever." Volume 2, Issue 1, Posted 07.58 AM / 11th January 2006. The Citizens Committee for a Lakewood Animal Shelter (CCLAS) is holding its annual Angel Tree fundraiser. Pets General Store on Madison and the Lakewood Public Library (main branch) on Detroit have been kind enough to host CCLAS's Angel Trees. Individuals can purchase, for $5.00, an ornament that will hold his or her name and a pet's name to be displayed on one of these trees. Volume 1, Issue 13, Posted 10.40 AM / 20th December 2005. There is an old saying that goes "find a job you love, and you will never work a day in your life". One Lakewood woman has taken that advice to heart, turning her passion for animals into a successful business. Although having lived in Lakewood for only a few years, Whitney Callahan has had a quite an impact on the community. In addition to helping lead the effort to build the local dog park, she has taken a leadership role in helping the Lakewood Animal Shelter. Volume 1, Issue 12, Posted 12.49 PM / 30th December 2005. October 1st at Lakewood Park. Volume 1, Issue 7, Posted 03.59 PM / 29th September 2005. Volume 1, Issue 5, Posted 11.10 AM / 23rd August 2005. Volume 1, Issue 4, Posted 06.21 AM / 09th August 2005. I heard a slight knock on the door about 5:00 pm Wednesday night, August 3rd. Thinking it was another neighbor wondering if we had power and what the police scanner was saying, I was a bit surprised to see Karen Reidy with binoculars in hand saying, "Jimmy, what do you think this bird is with a white head?" Volume 1, Issue 4, Posted 05.30 AM / 04th August 2005. This month I introduce you to neighbor, someone who shows her love of Lakewood through gardening. Silvia takes care of her own spectacular garden with the help of her husband, Gerry, and mom, Margaret Spots, as well as several other spots of greenery around town. She tends to the Adopt-a-Spot garden in front of the Drug Mart near the library, works on the Lakewood Garden Club's Pocket Park next to The Place to Be Deli, and donated the planters and plants that are in front of the businesses on Madison Ave. between Wyandotte and Bunts. Volume 1, Issue 2, Posted 10.46 AM / 14th November 2005. A farmers' market is an asset in any community. Lakewood is no exception, and the Wednesday afternoon North Union market is not to be missed. The abundant variety and colorful selections draw shoppers from all walks of life, while providing area farmers a direct link to the community they serve. Beyond the enjoyment of spending time on a summer afternoon sampling local peaches or organic honey and picking up some groceries, market participants have the opportunity to make a positive impact on our regional economy and local community. Volume 1, Issue 2, Posted 10.07 AM / 21st June 2005. Animal Lovers Enjoy Howling Good Time! The Citizens' Committee for a Lakewood Animal Shelter (CCLAS) marked the 20th anniversary of the Animal Shelter's opening with the "Hair of the Dog" happy hour fund-raiser on Thursday, May 26th at the Three Birds restaurant on Detroit Avenue. Over 90 guests enjoyed food and drink from the restaurant, as well as a live entertainment from Anne E. Dechant, the 2004 Scene and Free Times musician of the Year. Volume 1, Issue 1, Posted 02.08 PM / 06th June 2005.